As far as we can tell the wood floors in our house have never been refinished. There are nail holes in places which indicate that they were probably covered with carpet for a number of years. When we moved in, they still looked like they were in pretty good shape. 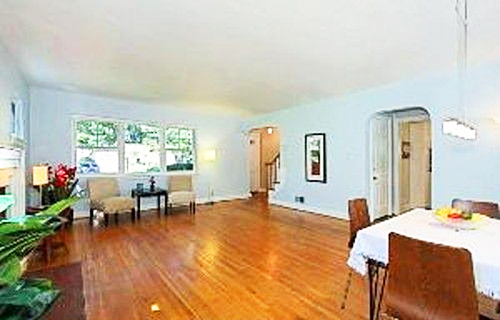 Here’s a picture of the living/dining room from the real estate listing. After living in the house for almost three years with two big dogs, however, the shiny top layer of polyurethane is almost completely gone. In fact, there are places where the wood is completely bare so it was time to act before we did any damage that we couldn’t repair. As I mentioned in my last post, we originally got a quote for just sanding, staining, and refinishing the existing hardwood floors which is about 775 sq. ft. and 13 stairs. The company we are going with came in at just shy of three grand for that work. We got one quote that was more and one quote that was less, but we liked these folks the best and they seemed to be the easiest to work with. In addition to sanding and staining, the quote included a layer of sealant and three layers of polyurethane. Since we are hard on our floors, we opted to go with the top of the line poly called Bona Traffic. From what I have read, using the “Traffic” grade poly should make the floors last about three times as long than if we used their next grade down Bona Mega. I am hoping the extra cost is worth it. Then we/I decided to see how much extra it would cost to install matching oak hardwood in the 10 x 10 kitchen. So I had the same company come back out and give me a quote for that. It came in at just over $1,100 for the wood and the work. So all told, we’re expecting the job to run just about $4,000 for about 875 sq. ft. of space. We know our floor is oak, but there seems to be some uncertainty about whether it is white oak or red oak. We think it is red oak, but the flooring people thought it was white so they are coming out this weekend to test it to be sure. Then they will leave the new wood for the kitchen here with us so that it has a week to acclimate before they begin installing it a week from today. Speaking of installation, we’ve got a bit of work to do this weekend to prepare for that. In order to save some money, Mark and I will be ripping up the old kitchen floor ourselves and installing sub floor so that the floor guys can just put down new wood floor without any extra work because as you know, work means time and time means money. After the new wood floors in the kitchen are installed next Friday, Mark and I will then have the weekend to ready the rest of the house for sanding and staining. This basically means packing up almost everything and relocating it to the sun room, garage, or basement. We are even going to try and stick one particularly unwieldy armoire in the bathroom so we don’t have to bring it down the stairs. Then on Monday, the floor guys will start sanding the floors down to their bare wood, which shouldn’t take too long in some spots, before staining and re-sealing it. It will take 5 days for the whole process and during that time we really can’t be in the house so we will be at a hotel. Then even once we move back in on Friday, we have to stay off the floors as much as possible for another week. That means no furniture or puppie paws so we will be relegated to the basement and the yard. Hopefully the weather is nice. Once two full weeks has passed, we can start to move our things back in. It’s going to be a rough two weeks, but I think it will be worth it. Mark and I have been considering stain colors for about 8 months now. We’ve gotten samples of several minwax stains but we don’t love any of them with all our hearts so we’re hoping they can come up with a custom stain choice that will be juuust riiiight. First we tried Minwax “Early American”, and we really liked it. We actually sanded Mark’s closet and put it down so we could see it on more than just one piece of wood. But after living with it for a month or so we decided that it wasn’t all that different from the color we have now and if we’re going to go through the effort to re-finish the floors we should choose something more dramatic. Next we tried the much darker “Jacobean” and again, at first we thought it might be our winner, winner chicken dinner. But upon further examination, we began to think that while we liked the darker tone, the color read a little too cool/ash for us. 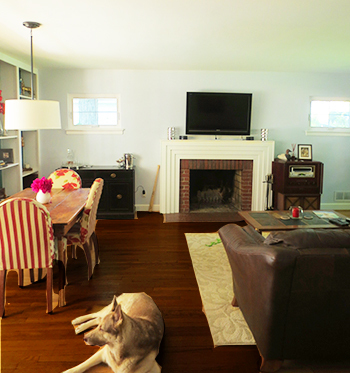 Here’s a picture of the current living/dining room mocked up to show what color we are hoping to achieve. There’s a little bit more red in this photos than we would ideally like, but you can see what we are leaning towards. Obviously we will show you where we really end up. So that’s some more of the nitty gritty on our floor re-do. I will have photos next week of the kitchen floor excavation. Have a great weekend everyone! ← We’re Getting Big Kid Floors!